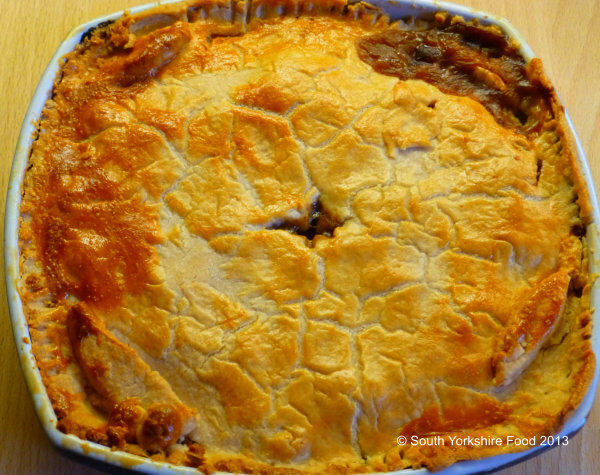 Meat and Tatie (potato) Pie is a typical Yorkshire dish. It is traditionally made with beef, but you could also make it with mutton orvenison.Traditionally served withMushy PeasandHenderson's Relishas a condiment, with gravy on the side. You will need a large pie dish, an oven-proof casserole, and a saucepan. Trim and excess fat and sinew from the beef and cut into 2cm cubes. Put the carrot and celery in your empty casserole dish. Add 1 tbs of the oil to a non-stick frying pan and saute the shallot over a medium heat until soft. Add this to your casserole dish. Add another 1 tbs oil to the saute pan and brown the beef in batches. Add them to the casserole dish when browned. Sprinkle the flour over the meat and vegetables and mix it around until everything is coated in the flour. Pour the stock into the saute pan, bring it to a boil, them simmer for a couple of minutes ensuring that you pick all meat juices and residue form the meat browning. Add the stock to the casserole and mix well. Add the tomato puree, crushed garlic, thyme and bay leaves, Hendersons Relish, if using, and a couple of good twists of black pepper. Cover the casserole dish and cook in the middle of the oven for 1½ hours, or until the meat is tender. Meanwhile cube the potatoes into 2cm chunks and cook in salted water until tender, but not breaking apart. Now make the pastry ( or use frozen if short of time, but homemade is better!). The easiest way is to use a food processor. Cube the butter and lard and add it with the flour to the processor. Whizz it until you get a crumb texture. Whizz the mixture again and slowly add the water through the funnel until the crumbs come together to form a ball. You may need less or slightly more than the 3 tbsp of water - it depends on the flour. Once you get a ball formed, stop the processor as over working it will make the pastry tough. Work the pastry in to a flat disk about 1cm thick, cover in clingfilm, and put into the refrigerator for at least 30 minutes. When the meat is tender, use a slotted spoon to take the meat and vegetables from the casserole dish and put it into the pie dish. Leave the gravy behind in the casserole, for the time being. Now drain the potatoes and add them to the pie dish with meat, mixing them carefully so the potato is evenly spread through the dish. Now ladle enough gravy into the pie dish so that the liquid just comes level with the top of the pie mixture. Any gravy left over can be served on the side with the pie. Roll out the pastry on a floured surface, until you have a sheet big enough to cover the pie dish. Roll the pastry carefully around the rolling pin and then unroll it onto the pie dish. Make sure the contents are completely covered, then use a sharp knife around the edge to cut off any extra pastry. Use your thumb and first finger to pinch the pastry on to the edge of the dish. Cut a small air hole in the centre of the pie crust pastry. Brush the beaten egg all over the crust to glaze it. Cook in the oven for about 30-35 minutes until the crust is golden and the pie is hot. Traditionally served with Mushy Peas and Henderson's Relish as a condiment, with gravy on the side.